I am so thankful for my ohana at Ka'ala Healing Arts where I have been a tenant since 2005. 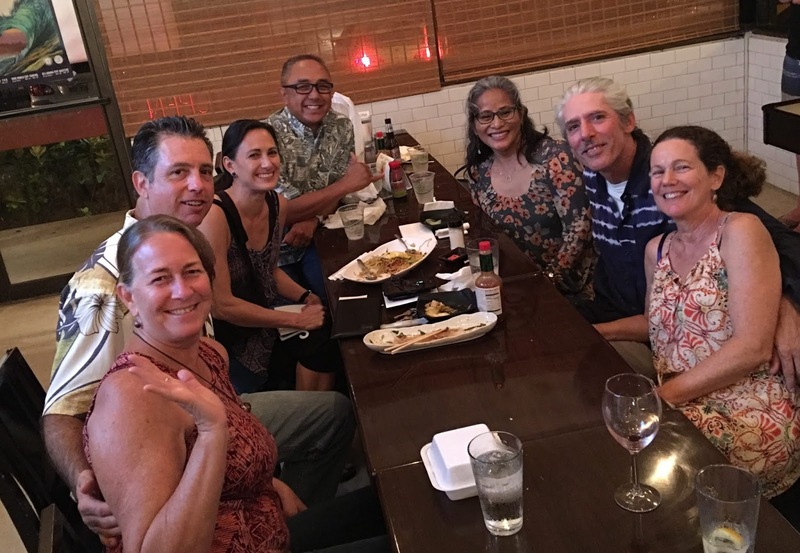 Last night, the owner and business manager of our building, Jeff Ramos, treated us all to a lovely feast at Kawailoa Tavern in Haleiwa. The food, service, and atmosphere was amazing. I highly recommend trying it out. It was amazing to reconnect with everyone. So much has changed in the last 13 years! Abby Parker is now an amazing ashiatsu instructor and has opened up a new massage clinic next to Pa'alakai Bakery where she can train other massage therapists to do specialty work. Jennifer Piltz decided to make a huge commitment to continuing her education and became certified in Structural Integration. Also, Jeff Ramos, in addition to managing the center and being a wonderful massage therapist, is now a firefighter. He is currently attending graduate school to study Psychology. As for myself, I have become certified to teach infant massage, meditation, and breathwork. I now focus on making massage therapy more accessible to the public by accepting health insurance and offering my community wellness massage program for pain relief. I had an amazing time getting to know Simona Fossati who manufactures Mana Healing CBD Oils. I also sat next to Eva Silva, from Intuitive Healing Hawaii and learned about her passion for massage therapy. I look forward to trying her services soon. The lovely Bessie Estonactoc, from Harmony Counseling, is such a pleasure to be around. Check out her services on her website. In addition to her counseling services, she is also a hypnotherapist. At the far end of the table, was Carrie Cochran, Licensed Marriage and Family Therapist, and Nancy Delamarter, who offers counseling and yoga therapy. I wish I would have gotten a chance to talk more with them! Jen Lau was on the far end of the table too. She is an amazing acupuncturist, and I see her regularly. She has successfully kept my neck pain at bay for one year and counting. I highly recommend her! Unfortunately, JoDana Newman of M.O. Wellness Center and Nikki Oishi could not make it to the dinner. There is also a new Ayurvedic skin care specialist, named Heidi, that was unable to attend. Oh, and yes! How can I forget the fabu"lash" lash expert, Sarah Matthews of Hoku Hale. She is amazing! Visit the Ka'ala Healing Arts website to find out more about these services. Last but not least, I got to know Marni. I wish I remembered to ask her last name. She is the new caretaker of the center and is in charge of sprucing up the greenery around the building. She sells amazing succulants, and I look forward to buying a few for my office. I will update this blog once I get her contact information. If it has been a while since you've been to Ka'ala Healing Arts, come and check us out! A lot has changed over the years. If you have any questions, feel free to call me anytime. I am always happy to help. Meanwhile, I look forward to seeing you soon for an amazing deep tissue or ashiatsu massage session. I take all health insurance policies that cover massage therapy in the state of Hawaii. This includes HMAA, HMSA, UHA, and Kaiser. If you aren't sure whether or not your policy covers massage, call me. I can look your information up quickly. at Integrated Massage in Waialua near Haleiwa.